IT HAS NOT PRODUCED a new apple for a century. Its apples are typically small — in one instance, no bigger than a golf ball. Some are covered with russet, and one is famously misshapen. Several are notoriously difficult to grow. None of its varieties is grown in commercial quantities in New England. Yet England’s apples have some of the best flavor of any fruit — not to mention some of the most colorful and evocative names. While you may have to hunt for some of them, all of these English apples made their way across the Atlantic long ago, and can still be found growing in New England orchards. Bramley’s Seedling is a late-season apple, round but flat, green with red streaks or patches and prominent lenticels. Its cream-colored flesh is coarse and moderately juicy. It is aromatic, and it has a nicely balanced sweet-tart flavor with hints of citrus. 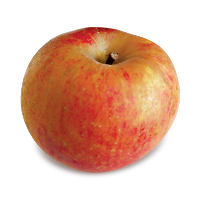 Bramley’s is excellent in cider, and it is England’s most popular cooking apple. Similar to apples such as Cortland, its skin can become naturally greasy in storage, and it keeps well. Bramley’s Seedling was raised from seed in the cottage garden of Mary Ann Brailsford in Southwell, Nottinghamshire, between 1809 and 1813. Matthew Bramley brought the property in 1848, and the apple bearing his name was introduced commercially in 1876. Cox’s Orange Pippin is as beautiful to behold as it is to eat. 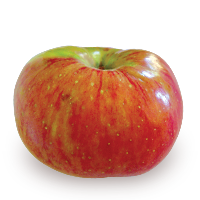 A mid-season apple, it is medium sized, round, and orange-red with red striping over a yellow skin. Its cream-colored flesh is crisp and juicy. Its flavor, more tart than sweet, is spicy, aromatic, and complex. It excels in cider as well as fresh eating. Richard Cox, a retired brewer from London, raised the apple in 1825 in the village of Colnbrook Lawn, Berkshire, from seeds of a Ribston Pippin. Its other parent is unknown. Cox’s Orange Pippin was introduced in America about 1850. Ribston Pippin, like its offspring Cox’s Orange Pippin, is both beautiful and delicious. Ready in mid-season, it is a small to medium in size, slightly conical in shape, with color that combines brown, gold, orange, and crimson. Its yellow flesh is crisp and juicy. Highly aromatic, its complex flavor is more tart than sweet at harvest, and it becomes spicy and sweet in storage, with hints of pear. But it does not keep for long. It is outstanding eaten fresh, and also good for cooking. Ribston Pippin was discovered in Yorkshire in the early 1700s, and became popular in New England, New York, and parts of Canada in the early 1800s. 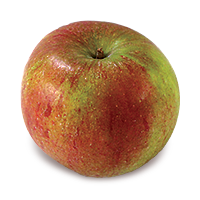 Ashmead’s Kernel may even exceed Cox’s Orange Pippin and Ribston Pippin in richness of flavor. 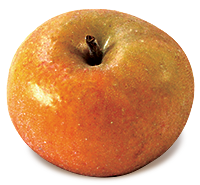 It is a mid-season apple, medium to small, round, with heavy russet and an orange blush covering a copper-colored skin. Its cream-colored flesh is crisp and juicy, and its balanced, sweet-tart flavor has hints of vanilla, orange, pear, nutmeg, lemon, and tea. Its flavor improves in storage, and it stores well. It is especially good eaten fresh and in cider. William Ashmead discovered the chance seedling that bears his name in his garden in Goucester in the 1700s. The term “kernel” is synonymous with pippin, or seed. 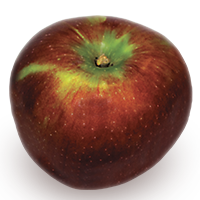 D’Arcy Spice is a late-season apple, round, medium to small, with russet and red-orange color over a thick, yellow-green skin. Its cream-colored flesh is aromatic, and its texture can range from tender to crisp. Its balanced, sweet-tart flavor, while somewhat mild, has hints of spice and nutmeg, and it becomes sweeter and more complex in storage. D’Arcy Spice was discovered growing in a garden in the village of Tolleshunt D’Arcy, Essex, in 1785. It was introduced by nurseryman John Harris in 1848, and was originally called Baddow Pippin. Knobbed Russet, or Knobby Russet, may well lay claim to being the world’s ugliest apple. It is a small, misshapen apple, its skin gnarly and russeted. Its cream-colored flesh is dense, and not very juicy. That it has survived for two centuries is testimony to its outstanding flavor, more sweet than tart, complex and nutty. It is best eaten fresh or pressed in cider. It stores well. Discovered in Sussex in 1819, Knobbed Russet was nearly extinct by the 1940s (in addition to its appearance, it can be difficult to grow), when it was rediscovered during England’s national fruit trials. If Knobbed Russet is the ugliest of apples, Pitmaston Pineapple may be the smallest. It, too, can credit its outstanding flavor for its survival. A small apple not much larger than a grape or golf ball, Pitmaston Pineapple is round or conical in shape with bronze skin covered in light russet. 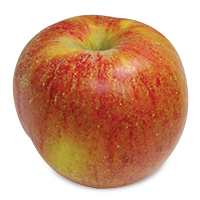 A mid-season apple, its crisp, cream-colored flesh lacks much juice, but it has a balanced sweet-tart, nutty flavor with hints of honey, and a distinctive pineapple taste. Its small size limits its utility for cooking, but it is outstanding for fresh eating and good in cider. Pitmaston Pineapple was discovered by a Mr. White around 1785, possibly from the seed of a Golden Pippin. It was presented to the London Horticultural Society in 1845 by Mr. Williams, a nurseryman from Pitmaston. In stark contrast to Pitmaston Pineapple, the mid-season Howgate Wonder alone among English apples is exceptionally large in size. 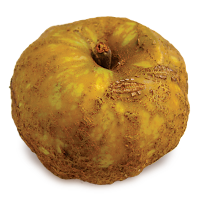 Brownish-red over a yellow-green skin, it has crisp, juicy cream-colored flesh. Its mild flavor is more sweet than tart. It holds its shape when cooked, and its flesh turns yellow. It is good for fresh-eating apple and in cider. It develops a harmless greasy skin in storage. A Howgate Wonder held the unofficial title of world’s largest apple in 2012, weighing in at three pounds, 11 ounces, and seven inches in diameter, with a 21-inch circumference. Howgate Wonder is relatively new among English varieties, discovered in 1915 by G. Wratton, a retired policeman of Howgate Lane, Bembridge, in the Isle of Wight. It was introduced in 1932. The original tree lived until the 1960s. 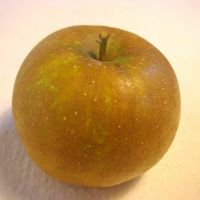 Howgate Wonder has English parents; its size can be traced to Newton Wonder (1887), and its greasy skin from Blenheim Orange (1740). 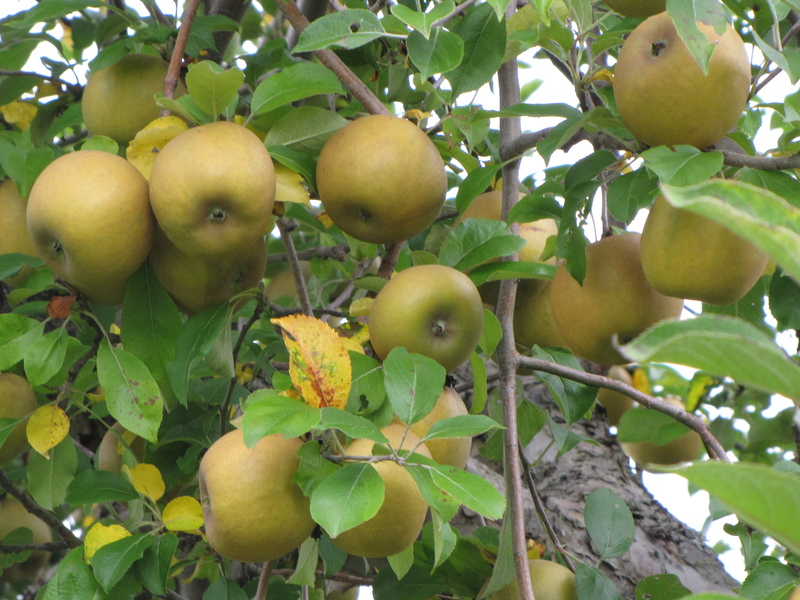 Other English transplants to New England’s orchards include the yellow-green Claygate Pearmain, and Lamb Abbey Pearmain, a red-striped apple on yellow skin, both from the early 1800s. To find orchards that grow these unusual apples, visit New England Apples and follow the link for “Find an Apple Orchard” to search by state or variety. COME VISIT the New England Apples booth in the Massachusetts State Building at the Eastern States Exposition (“The Big E”) now through Sunday, September 28, from 10 a.m. to 9 p.m. daily. The booth features fresh apples, fresh cider, cider donuts, apple pies, and other baked goods. Fresh apples are being supplied by Massachusetts orchards Atkins Farms in Amherst, The Big Apple in Wrentham, Brookfield Orchards in North Brookfield, Carlson Orchards in Harvard, Clarkdale Fruit Farms in Deerfield, Cold Spring Orchard in Belchertown, Pine Hill Orchards in Colrain, Red Apple Farm in Phillipston, and Tougas Family Farm in Northborough. The booth features award-winning cider donuts made by Atkins Farms in Amherst, fresh, crisp apple cider from Carlson Orchards in Harvard; and fresh-baked apple pies and apple crisp made with apples supplied by Cold Spring Orchard in Belchertown. Executive Director Bar Weeks and Senior Writer Russell Powell are on hand every day to meet with people and answer questions about apples. Their new book, Apples of New England, is available for sale and signing, along with their first book, America’s Apple. The 2015 New England Apples full-color wall calendar, the revised New England Apples brochure/poster, and brochures from member Massachusetts orchards will be available to visitors during the fair, the largest in New England. Last year’s fair attracted 1.4 million visitors. PERHAPS THE MOST OVERLOOKED apples are the russets, undoubtedly due to their dull, rough-looking skin. It is a shame, as they are some of the most flavorful apples anywhere. Several varieties are especially prized for cider. Russeting occurs naturally in many varieties, but is seen as a defect in others. It may appear on a portion of each apple, or cover its entire surface. Many of the fully russeted varieties are medium to small in size, limiting their mass appeal in today’s world of super-sized portions. 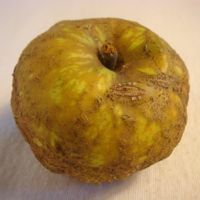 Most russets are excellent keepers, but therein lies a source of their commercial decline: as storage techniques improved a century ago, the russets fell out of favor, undoubtedly hastened by consumer preference for a shiny red (or gold or green) apple. But if you can set aside the aesthetic demand for a uniformly smooth and shiny skin, your taste buds will be richly rewarded. 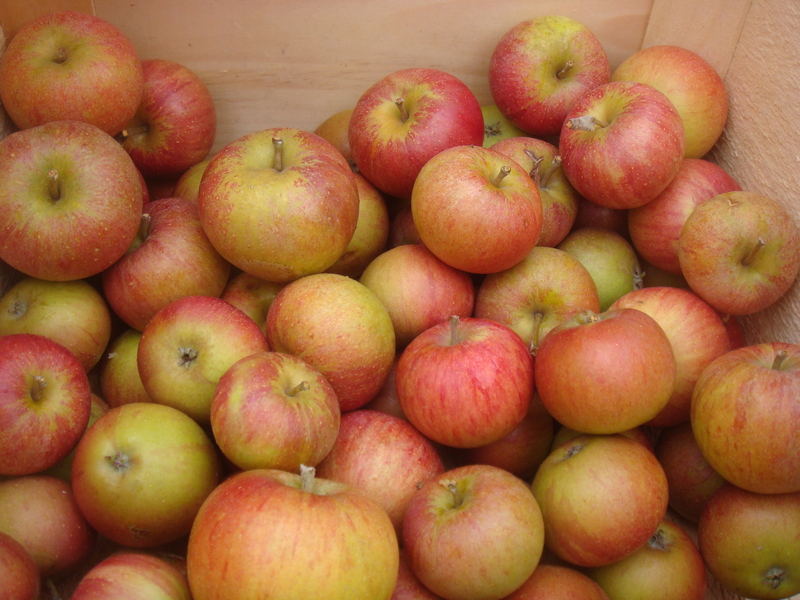 In an earlier post, Orange New England Apples, we sang the praises of several russeted varieties, such as Ashmead’s Kernel and Hudson’s Golden Gem, both of which are excellent cider apples. The distinctive variable russeting against a red background on varieties like Orleans Reinette can be striking in appearance. We admit that most people consider the Knobbed Russet unattractive, if not downright ugly. But beauty is in the eye of the beholder, and we consider the russets to be stunning in their subtle coloration and compact shape. We feature five here: the aforementioned Knobbed, plus Golden Russet, Pitmaston Pineapple, Pomme Grise, and Roxbury Russet. They are linked not only by their coppery brown exteriors and intense flavors, but also by their rich histories and colorful names. 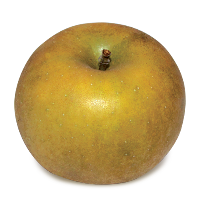 Golden Russet is a firm, sweet apple with a fine-grained yellow flesh. It had its beginnings in western New York state in the 1800s, where its exceptional sweetness made it a favorite with cider-makers. 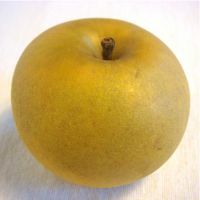 Golden Russet is still considered to be one of the very best varieties for cider, but it is good for fresh eating and cooking as well. Knobbed Russet is the strangest looking apple in our experience. It sports a gnarly but edible skin covered with warts and welts. But it is more than a novelty. Like the frog that became a prince when kissed, the Knobbed Russet’s character is magically transformed when bitten into. Its bold flavor is superior, strong and earthy, rich and sugary. It has a firm and dense, crisp golden flesh. Also known as Knobby Russet, it was first grown in Sussex, England, in 1819. Pitmaston Pineapple is a small, juicy apple good for both fresh-eating and cider. It has a sweet, nutty flavor with a hint of honey, and a pineapple taste that gives the variety its name. Pitmaston Pineapple originated in the town of Pitmaston, near Worcester, England, in the late 1700s, and was presented to the London Horticultural Society in 1845 by Mr. Williams of Pitmaston. Its parentage is unknown. 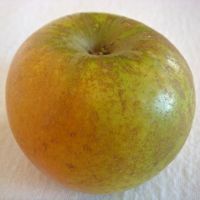 Pomme Grise has many similarities with Pitmaston Pineapple: it is a small, round, juicy apple with thick, tough skin lightly covered with brown russeting. Its pale yellow flesh is firm, crisp, and aromatic, with a unique nutty, spicy flavor, making it a popular choice for cider-making. Also known as Gray Apple, Pomme Grise originated in Canada, and was widely grown in New York’s St. Lawrence valley in the 1800s. Roxbury Russet is America’s oldest cultivated apple variety, first grown in Roxbury, Massachusetts in 1635. This exquisitely flavored heirloom has had a host of names over the years, including Belpre Russet, Boston Russet, Hewe’s Russet, Marietta Russet, Putnam Russet, Shippen’s Russet, Sylvan Russet, Warner Russet, and — our favorite — Leather Coat. 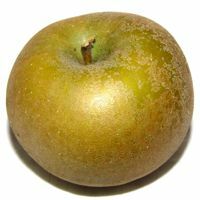 Roxbury Russet has a coarse, crispy yellow-green flesh. Its spicy-tart flavor is as good for fresh-eating as it is for making a fine syrupy cider. Its parentage is unknown. IF YOU ARE FORTUNATE ENOUGH to find some russets at your local orchard or grocery store, here is a recipe that emphasizes their rich taste. Most russets are slow to brown when sliced compared to many varieties, making them especially good in salads. Slice fruit into long spears and place in a medium bowl with celery. Whisk lemon juice, vanilla, oil, and salt. Pour dressing over fruit. Top with tarragon, walnuts, and cheese. 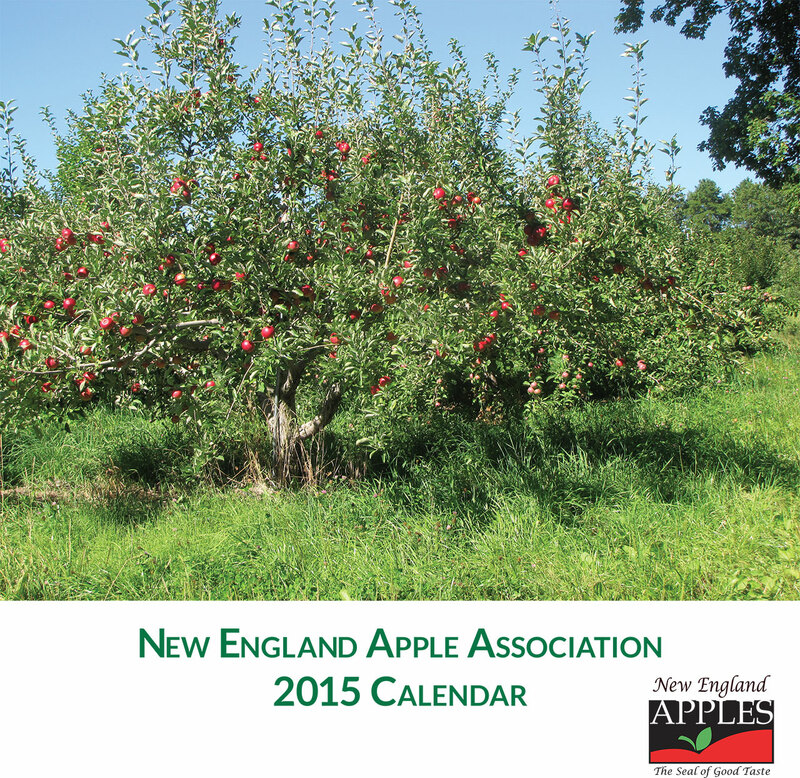 THE 2015 NEW ENGLAND APPLES WALL CALENDAR is a great way to learn about the region’s apples and keep the beauty of the orchard nearby year-round. 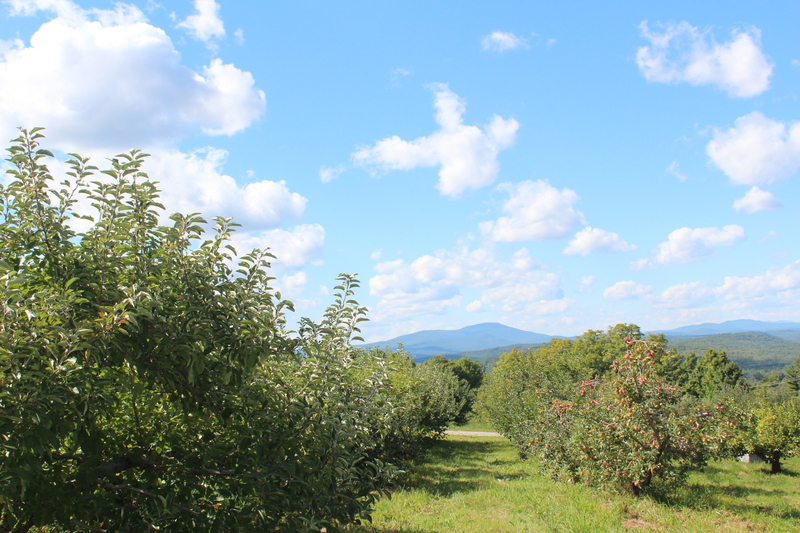 Each month features a different New England apple variety and orchard. The 12”x12” full-color calendar makes an ideal gift for the apple lovers on your list. To order your calendar, send $12.95 ($9.95 plus $3.00 shipping) to New England Apples, P. O. Box 41, Hatfield, MA 01038. Make checks out to New England Apple Association. We’ll send your calendar out within 24 hours of receiving your order.